End of summer special, the water is still warm and in the mid to high 80s, so come learn to roll your kayak with Chad. Rolling is one of the essential skills for sea kayakers, white water kayakers, and anyone paddling in dynamic water, that opens the door for advanced learning opportunities. Contrary to popular belief, rolling is not a test of strength, but rather a skillful paddling stroke requiring finesse and timing. A kayak roll is, in fact, the fastest type of self rescue when kayaking. So, if you don’t have a roll, let us teach you one. If you have one, let us help you refine it so it becomes bomb proof. Normal cost for this class is $80. However, for a limited time Sweetwater Kayaks is offering this class for $40** ($35 for repeat sessions). Classes are taught one on one at our rental operation at Weedon Island Preserve. Contact the shop at (727) 570-4844 to schedule your class. A sit in style kayak with foot pegs, thigh braces, paddle, USCG approved life jacket, and a proper fitting spray skirt. Please let us know if you will be bringing a kayak or if you need to borrow one of ours. Swim mask with a covered nose or a nose clip and swim goggles. Proper foot covering. NO flips or open toed sandals please. Dress for immersion. NO cotton please. If you need recommendations on clothing, please contact the shop. Dry clothes for after class. Classes are taught by Chad and are up to 2 hours in length. Pre-payment required for discounted price. Classes are held at Weedon Island Preserve, weather permitting. Multiple classes may be required to obtain a roll. Refunds require a 24 hour cancellation notice. Wet exits are introduced in our Fundamentals course along with self and assisted rescues. The use of a skirt with a wet exit, review of rescues from our Fundamentals course, and advanced rescues techniques are included in our Beyond the Fundamentals course. Neither the completion of the Fundamentals course or the Beyond the Fundamentals course is required for the Rolling class. Sweetwater Kayaks' Annual Symposium is just around the corner, February 2019. Classes are now forming. For more information click on the picture. FOLLOW US ON FACEBOOK FOR UPDATES ON TRIPS AND EVENTS!! BOTTOMS UP!! Sweetwater Kayaks offers one on one rolling classes. Contact the shop for details and to make reservations. A life jacket and an "audible signaling device" (a.k.a. whistle) are required for kayaking, canoeing, and standup paddleboarding (SUP). Please wear it..... We don't want you to become a statistic!!! 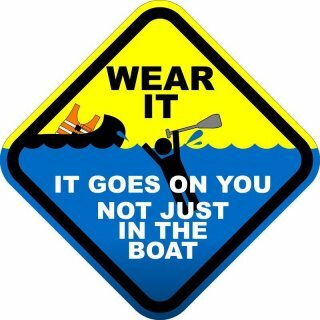 For more information on boating requirements click on the picture or visit our GEAR page. Paddle Board yoga classes each Sunday, call the store for details.